I have been advertising since 2005 on Outbrain so I have an inside opinion on them as an ad network from an advertiser's perspective. Today targeting capabilities are better than ever for direct response marketing, awareness, and education. Does that mean you should use Outbrain? Outbrain is a native advertising network that partners with CNN, Bloomberg, and other publishers to connect them with advertisers. Advertisers use Outbrain to show ads that mimic editorial stories, paying when someone clicks on the ad. Outbrain shares the revenue from advertisers with the publishers. Access to CNN, Time, ESPN, and more. Outbrain is simple to use with an intuitive UI for advertisers who have run campaigns on other ad networks. It offers a familiar ad format to Facebook on some of the most sought after websites with global reach. You are able to start on Outbrain for as little as $10 making the barrier to try out very low. Outbrain is one of the more difficult ad networks to get your creative and landing page approved. I have seen them allow more direct response type landing pages in the past few months. Another issue is you need an account manager to launch "whitelist" campaigns that are limited to select publishers. The minimum budget for a campaign is $10/day or $300/month, and the minimum cost per click (CPC) is $0.03. Minimums do not reflect reality. Expect to start your CPC around $0.10 to $1.50 depending on your industry. A real-world test budget is going to range from $500 to $2,000 to find publisher sections that result in conversions. Do you currently advertise on Facebook or Google? Then Outbrain is likely a good fit to try out as long as there is some content. Outbrain is the most strict when it comes to approving advertiser creatives, so review the guidelines before launching a campaign. When aiming to amplify reach for brand awareness, education or audience growth then Outbrain is an excellent fit. 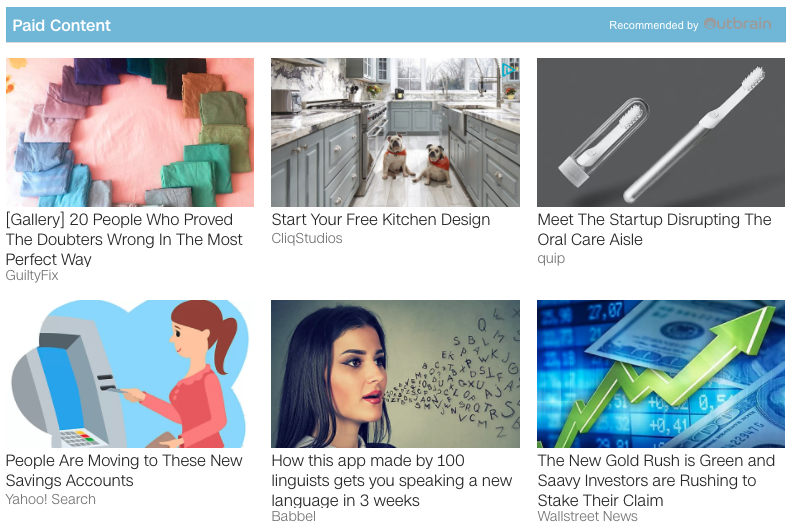 Direct response marketers with a clear, compelling story are seeing massive success on Outbrain. Examples include Home Chef, Babbel, and Ancestry. On the opposite side, Tophatter sends people to a page of 90-second auctions. The product stands on its own. Check out 50 Native Ad Examples 2018 to see more ad creative & landing page angles that work. Measuring results with Outbrain is two-fold. First is account structure with campaign naming conventions because all targeting for optimization exists as campaign settings. Second is using tracking tags for the campaign, publisher, section, and ad creative. You are going to have broad targeting of all websites in Outbrain's network to start; so make sure to limit everywhere else. Once you have those either sign up self-serve or contact Outbrain sales by requesting a demo. May you have success with Outbrain then use Brax to streamline and scale your native advertising :).